The government has published an analysis of the UK's options if it left the EU - suggesting they would all be worse for the economy than staying in. Foreign Secretary Philip Hammond said the aim was to "smoke out" Leave campaigners who had "avoided" spelling out their vision of a post-EU Britain. The document says the UK would lose influence and exporters could be hit with damaging tariffs. But Leave campaigners said the "dodgy dossier" was misleading. Iain Duncan Smith - one of five cabinet ministers campaigning in favour of a vote to leave the EU - said it misrepresented the Leave case by suggesting Britain could follow the example of other non-EU countries, such as Norway or Switzerland. He said: "The truth is, we won't copy any other country's deal. We will have a settlement on our own terms - and one that will return control of our borders, and money to Britain. That's the safer choice." He said the government was "in denial" about the risk of remaining a member of the EU. "This dodgy dossier won't fool anyone," he said, adding that the "real uncertainty is the future of the EU project". Cabinet ministers are allowed to campaign freely on either side of the debate, but the official government position is in favour of staying in a reformed EU in the 23 June referendum. The document says Norway and Switzerland's trading arrangements outside the EU require them to make financial contributions, accept the EU principle of free movement of people and be subject to other EU laws. Meanwhile, Switzerland and Canada's arrangements provide only limited access to the single market, it adds. 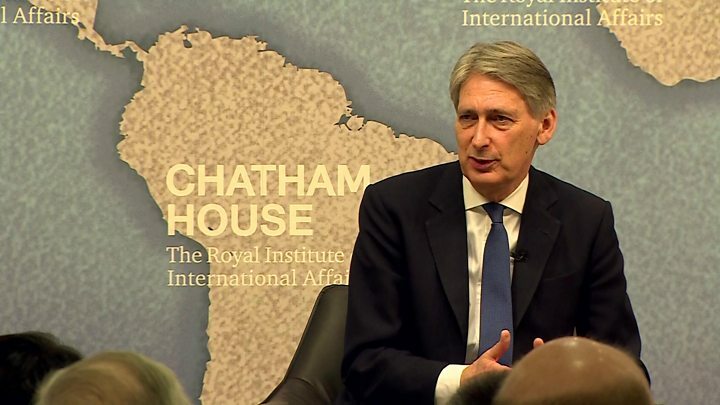 In a speech in London, Mr Hammond said Britain would be locked in talks with the EU for two years after an exit, while "our competitors, including our EU competitors, forge ahead". He said there was no guarantee the UK could reach a deal within the two year limit, and talks could drag on for many years because there would be no "goodwill" from member states to help the UK get a deal. He claimed Leave campaigners had "deliberately avoided" sketching out what a post-exit trade deal would look like because there were no "credible" options that "come close to the deal we already have on the table" that had been negotiated by David Cameron. Mr Hammond said Leave campaigners should be "honest" with voters and say "they are prepared to sacrifice jobs and growth in order to get a clampdown on migration, in order to stop paying into the EU". He said he hoped the dossier would force Leave campaigners to "put some flesh on the bones" of their vision of a post EU Britain. The official government analysis of UK membership of the EU is required by law under the EU Referendum Act, which paved the way for the in-out referendum on EU membership. If Britain votes to leave the EU, it will have to negotiate a new trading relationship with what would then be a 27 member organisation, to allow British firms to sell goods and services to EU countries without being hit by penalties or sparking a trade war. The government paper runs through examples of other countries, such as Norway, Switzerland and Canada, who have trade deals with the EU without being members - as well as the option of breaking free from the EU altogether and striking deals with individual countries through the World Trade Organisation. These scenarios have been mentioned by anti-EU campaigners in the past. Speaking to the BBC, Norway's prime minister, Erna Solberg, said she would like her country to be part of the EU because it lacked influence over important decision making and had "basically... left part of our democracy to Europe". Asked if she thought Britain could retain access to the single market without being subject to free movement of people, she said: "To believe you'll get everything you want without giving something back does not happen in any political body." The government paper says they each carry serious risks for business - but Leave campaigners say the analysis is flawed because it does not consider the possibility of a bespoke trade deal between the UK and the EU, with no tariffs or trade barriers. Gerard Lyons, of investment managers Black Rock and chief economic adviser to London mayor and Leave campaigner Boris Johnson, said it would be "a shock for both sides" if Britain left but it would be in the EU's interest to reach a trade deal with the UK as it was one of the EU's biggest export markets. Meanwhile, Lord Lamont has become the latest Conservative grandee to nail his colours to one side or other of the EU debate. Lord Lamont, who was chancellor in the early 1990s when Britain crashed out of the European Exchange Rate Mechanism, is calling for Britain to leave, arguing in the Daily Telegraph that the country could succeed economically and would regain control of immigration.